Jamie Collier reached inside the oversize canvas shopping bag and pulled out their recent purchase from a local hardware store. “I can’t believe we had to fly all the way back to Montevideo for this.” She handed the cutters to her soon-to-be ex-husband, suppressing the desire to use swat him over the head. Dex took the cutters from her and opened the handles so he could apply the business end of them to the object of their mission. “Never mind.” He was certain it had been her idea to put the padlock on the front of the fountain, but it would save time if he didn’t argue. She pressed her body up against his back so she could reach around and help him squeeze the cutter’s handles. Irrationally, he started to feel aroused, but that was the only thing he found attractive about her anymore. “Come. On. You. Son. Of. A…” They both cried out as the padlock suddenly gave and they lost their balance, falling against the fountain’s railing. “Get off me.” Holding the tool in one hand, stood up, pushing her away from him. As she took the hardware and hid it away, Dex bent over and picked up the now broken lock with their initials carved on it. Thirty minutes later and the second they got their room’s door shut, they were ripping off each other’s clothes. They’d have to call room service for dinner since they would be naked in bed together for the next twelve hours or so. Dex and Jamie couldn’t stand being tied or locked to each other, either by symbolism or marriage, but they couldn’t live without each other, either. I wrote this for Photo Challenge #207 hosted at Mindlovemisery’s Menagerie. The idea is to use the image above to inspire the crafting of a poem, short story, or some other creative work. I’d heard about Love Locks before, and apparently they’re popular in Europe. 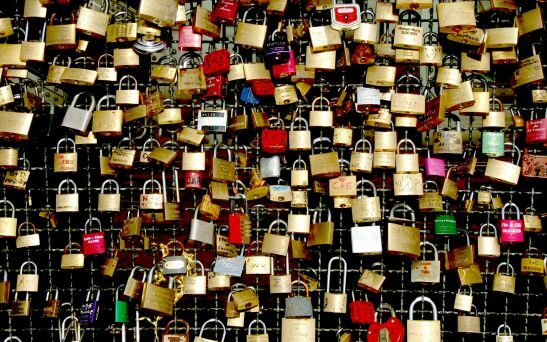 The idea is for a couple to carve their initials on put padlock and then lock it on some public structure. 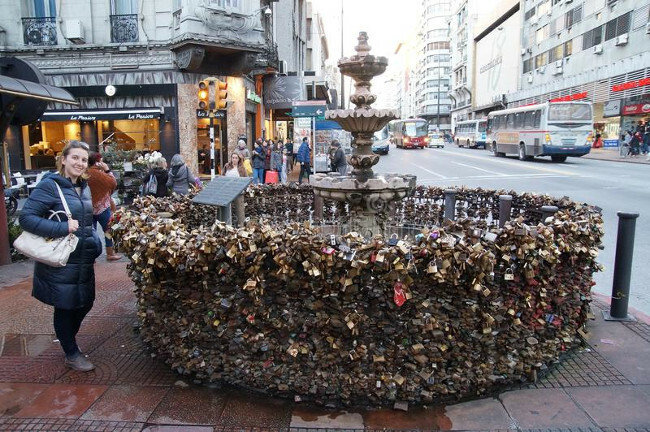 Usually it’s a bridge railing, but sometimes other locations are used, including a fountain in Montevideo, to symbolize everlasting love. But what if the couple wants to break up? I was also reminded of the “Praying for the End of Time” portion to the song Paradise by the Dashboard Light, written by Jim Steinman and recorded by Meat Loaf (Marvin Lee Aday) on his 1977 album “Bat Out of Hell” (lyrics HERE and YouTube video HERE). Of course, there are couples who should never marry, but who otherwise manage to “get along” pretty well. Thanks, Penny. I’ve heard of couples like that myself which is where some of this is coming from.